Something special is brewing in the Honduran city of San Pedro Sula. Cerveceria La Veinte (La20) has created a world-class brewery, with beers brewed for Hondurans by Hondurans using many local ingredients. 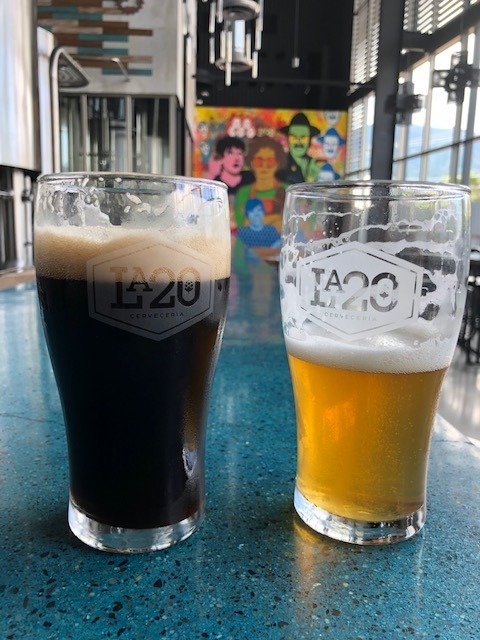 Now the second largest brewery in Honduras, with a capacity of 12,000-15,000 hectoliters/year, La20 is a must-see brewery that represents the exciting craft beer boom currently taking place throughout Latin America. Today, for the first time ever, La20 beer will be pouring out of taps at five different bars throughout San Pedro Sula! 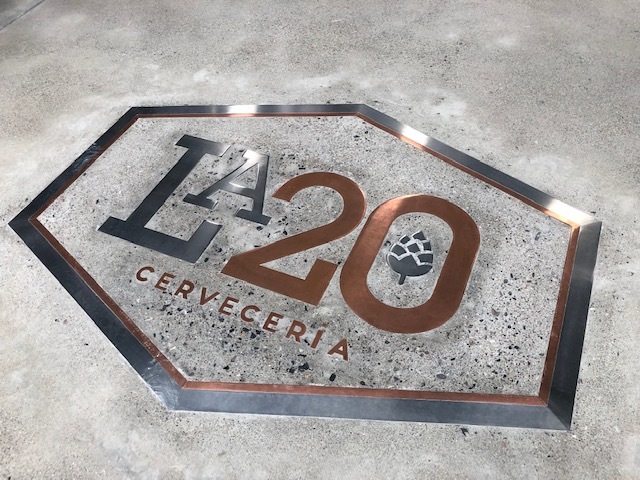 I had the chance to chat with Hector, the Head Brewer at La20, about his important role at this new brewery and what the future holds for craft beer in Honduras. Hector (center) and fellow La20 staff standing proud in their new brewery. Where are you from? La Ceiba, on the northern coast of Honduras, in the Caribbean. And how did you get into brewing? Well, I Studied chemical engineering and the two fields I wanted to be in were oil or brewing. So, here in Honduras we don’t have oil [Laughs]…soooo, brewing. First I had to work at the soft drink plant and then work my way up into brewing. How did you end up at La20? I don’t know, luck [Laughs]. I sometimes tell Floris, God! My final interview was in Miami, with Floris. He actually called me to tell me. He was the one that convinced me. I was 12 years at my other job so it was a big change. What is the most exciting part of your job? Making new types of beer. I mean, I was only making 4 brands and they were all pilsners. I am basically learning all different types of styles and getting to know new ingredients. We only used 2 types of malts at the other brewery, now we have 15! New hops. For me that is exciting. Getting to see the spectrum of the beers and be able to make them and, uh work with you guys – Kathinka. Working for Floris for me is like a personal and professional realization; he is such a good brew master. I had good teachers at the other brewery but nothing like Floris. What is the biggest challenge you face in your job? Well, now we’re at start-up so everything really. Learning the new styles. Executing with the equipment we have is pretty straight forward but just having all the brewing plus the bottling line and opening the taproom. We are juggling different things. And we still haven’t opened! That will be a whole other challenge when we have clients to tend to. What sets La20 apart from other breweries in Honduras? I think the beers first thing. We have beers that I think nobody has ever tasted. I am very satisfied with what we have done for now. And they are still not finished. Once we have perfected our recipes we will have really good beers to offer. And, we are all Hondurans. I think our beers have a Honduran identity. We want to appeal to the people to feel proud that they can have a beer to relate to. The flavor, like we say in Spanish, the Sazon, is all Honduran. For example, the Belgian wheat – the cardamom, all the spices are from Honduras – the orange peels, everything we can put in we have tried to source locally. What is your favorite beer at La20? I like them all but I would say the Viejo Verde(porter). I like coffee and it has very powerful coffee flavor. We want to step it down but it was nice. It was interesting, something that I have not tried before. 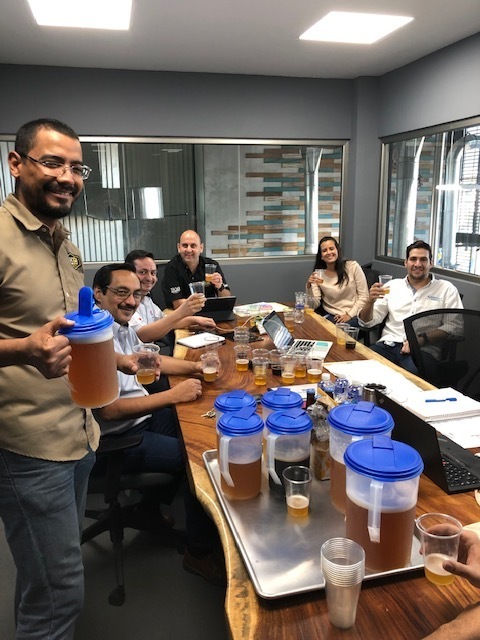 Where do you see the craft beer industry in Honduras in 5 years? I think it is going to go up faster than we believe. It’s going to grow. I think people are ready, the market is ready for something different. I see how people are craving something different. Craft beer is recently… I think in the last 2-3 years, people are importing craft beers. Locals have started brewing. I am certain we will have better beer and people are going to love it. I think we will be the reference – we should be, because of the investment made and the consulting we have. As a team, here at the brewery, we wonder “Why can’t Hondurans aspire to have a very good craft beer made locally?” That is our team goal and that value we want to bring to the market. I think our challenge will be our economy. You know, it is a more expensive beer. But people are paying this price or more for other beers, so lets hope they value that. Thank you to Hector for sharing his experiences and passion for creating beautiful beers for the people of his country. We look forward to tasting the sazon of La20 and seeing the craft beer market in Latin America continue to thrive. Salud!